1. Begin by making your dressing: Mix together the balsamic vinegar, hazelnut oil, cacao powder and salt. Thin to you desired consistency with water. The cacao powder may not dissolve very well but that is ok! 2. 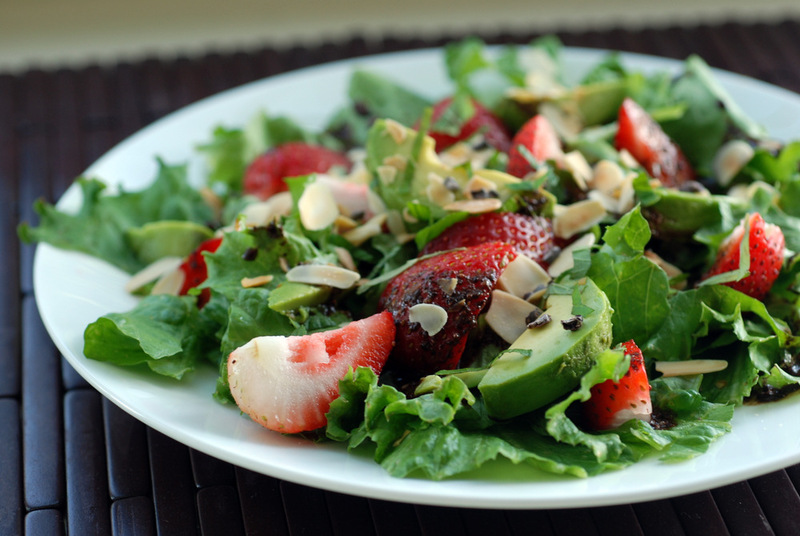 For the salad, plate the lettuce, top with strawberries, avocado and mint. Add almonds and cacao nibs just prior to serving. I am really liking the sound of this salad! The use of the cacao powder and nibs sounds amazing! $15 a week on groceries?! I am totally impressed. This is certainly the most intriguing salad dressing I have seen a long while. I live in Mexico, where we use chocolate in many savory ways, but I have never tried it in dressing. Cocoa nibs, yes. But the raw powder no. Until now. Will definitely try this! That does sound so interesting and good! I’m addicted to fresh fruit too … I have so much right now, including strawberries! Think I will need to try this salad stat! This looks lovely! I do like chocolate balsamic, try filling a bottle 1/3 full of cocoa nibs and topping up with balsamic and leave for a good few weeks to infuse. Delicious. Your fridge sounds just about like ours–we have strawberries, blueberries, nectarines, peaches, cherries, and lots and lots of plums. 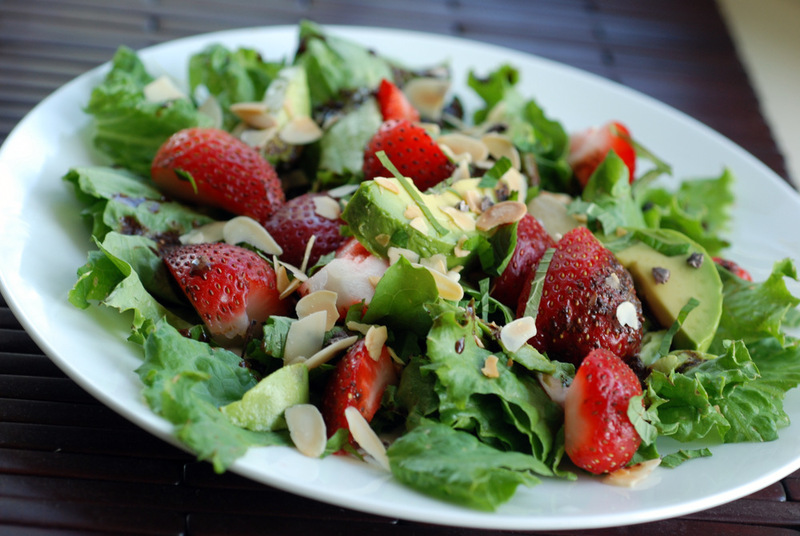 Salads like this sound like a perfect way to eat my way through all that fruit! Hehehe, yeah, I just bought peaches, too! And a cantaloupe, too… muahahaha! 🙂 Gotta love the summer! Wow I am impressed with your grocery bills! I don’t think mine has ever been that low even if I was just buying produce. Teach me, oh wise one! In this Toronto heat, salad is all that will do for me, too! 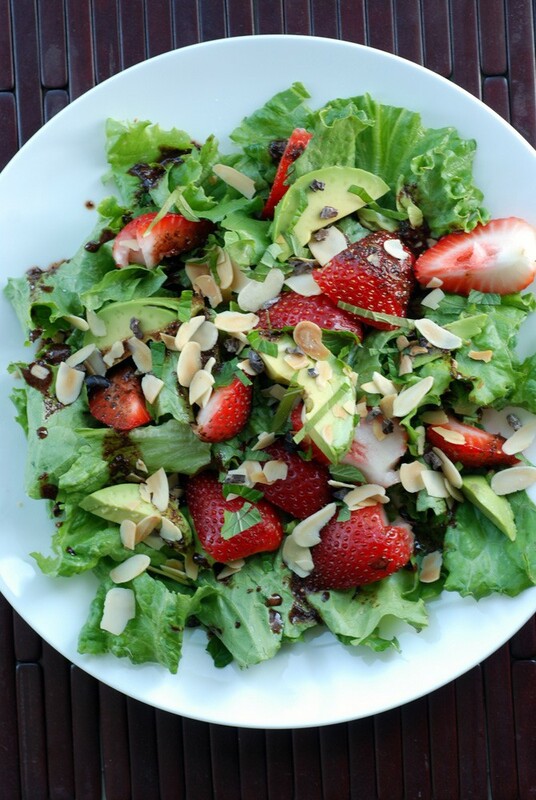 We are craving the same things 🙂 Chocolate balsamic is quite the daring move, but I like the idea of it paired with strawberries, I think I might have to give this a try! it is finally summer here and lots of fresh beautiful roduce waiting to be eaten.. made a similar dressing a while back with melted chocolat and balsamic! One word…amazing! I love the way you are pushing the boundaries and making a salad with ingredients that are just not commonly used. It sounds very impressive. Thanks for entering this months simple and in season. Cool, Janet, very cool! Strawberries and chocolate – love it! Also chose this as a featured dressing this week!